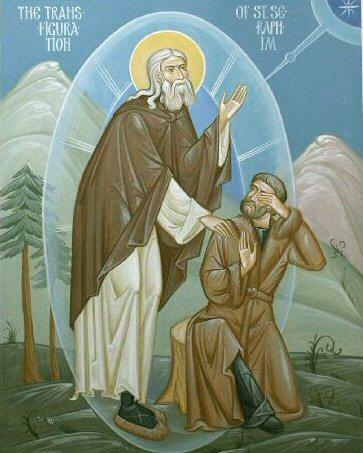 Motovilov wrote down many of his conversations with St Seraphim, including this famous Talk On the Purpose of the Christian Life, that took place in November 1831 in the forest near Sarov. This event has been depicted in several different icons of St Seraphim, and the account is considered one of the spiritual treasures of Russian Orthodoxy. Prayer, fasting, vigil and all other Christian activities, however good they may be in themselves, do not constitute the aim of our Christian life, although they serve as the indispensable means of reaching this end. The true aim of our Christian life consists in the acquisition of the Holy Spirit of God. Some people say: ‘These passages are incomprehensible… But there is nothing incomprehensible here. This failure to understand has come about because we have departed from the simplicity of the original Christian knowledge. Under the pretext of education, we have reached such a darkness of ignorance that what the ancients understood so clearly seems to us almost inconceivable.